Filmed in Limerick and created by the man behind Game of Thrones. It lands this week. In terms of relatively recent TV shows, Ireland's isn't exactly an unknown quantity. For example, Vikings is gearing up for its sixth season in Wicklow's Ashford Studios, The Tudors was also filmed nearby at Ardmore, and a tiny show that you may know, Game of Thrones, has turned Northern Ireland into one of the world's most enviable locations. But there's always room for one more and in a very happy coincidence, another George R.R Martin novel has been adapted on these shores but it's as far away from Westeros as you could get. In 2093, a team of scientists embark on a journey into space aboard an advanced ship called the Nightflyer to make first contact with alien life-forms. On the eve of Earth's destruction, the crew intercept a mysterious alien spacecraft that might hold the key to their survival. As they near their destination, the crew discover that the ship's artificial intelligence and never-seen captain may be steering them into the deadly and unspeakable horrors which lie in space. However, when terrifying and violent events occur, the team begins to question each other as they slowly realise that there is something on-board the Nightflyer with them. The original novella was published in 1980 and after the first few trailers were released, viewers couldn't help but draw comparisons with other classics of the sci-fi/horror genre like Alien and Event Horizon. Hell, Martin even described the ten-episode season as “Psycho in space." 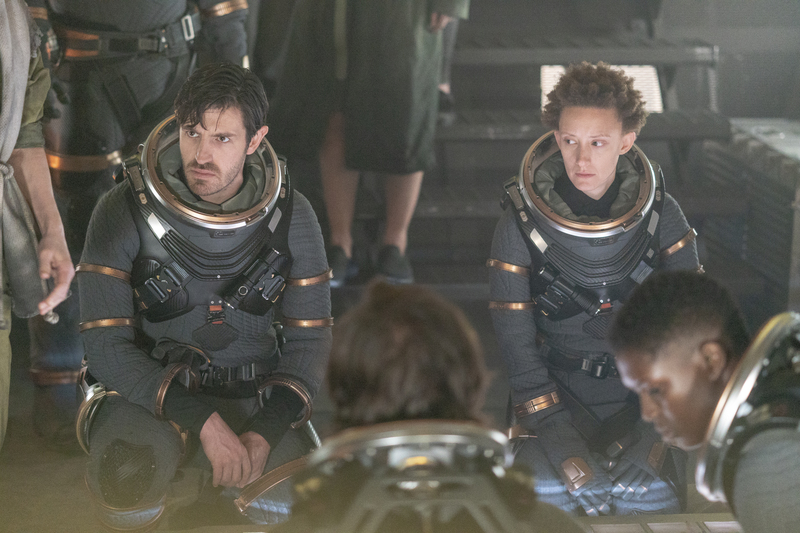 Rather than shy away from these comparisons, the show's creator, Jeff Buhler, is embracing them while doing his very best to steer the horror in Nightflyers away from what audiences might expect. Ahead of the show's release, JOE had the chance to head down to the incredibly impressive Troy Studios in Limerick to chat with Buhler about the eagerly-anticipated show. "When I was pitching my take on it, I used The Shining in space as a reference. We've got about 12-15 little nods to The Shining throughout the series," said Buhler. Various other horror titles have an influence on the events that unfold in Nightflyers, but Buhler was keen to ground the blood, guts, and gore in reality. "I thought Event Horizon was really fun and clever. For me, going back to Ridley Scott's Alien, that was the film that sort of changed my life. As a kid, I loved Star Wars but Alien was the first film where I felt I thought what it would actually be like to be in space. Those are the films that I love. When I watched Alien for the first time, I thought 'Oh God, this is real!' Some of those elements of creating a world in space that feels grounded, realistic. "Jacob's Ladder was another psychological horror that I loved - and I worked on a reboot. I grew up admiring the way the psychology gets under your skin. 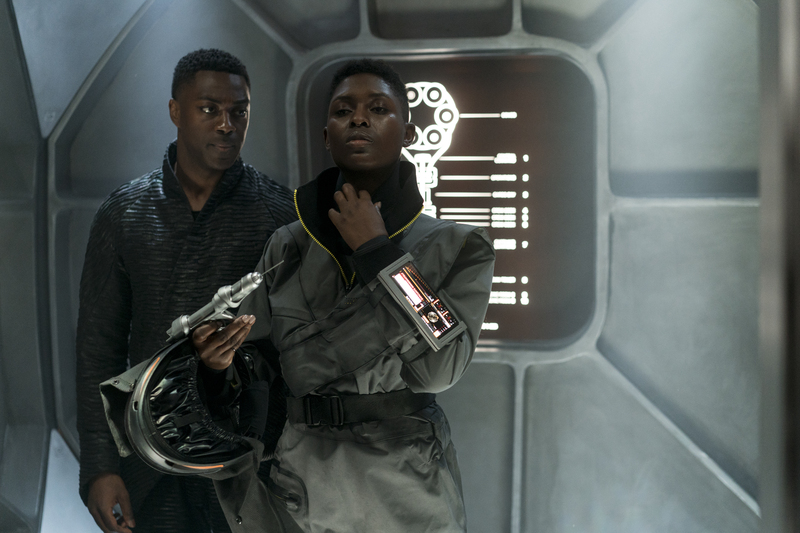 There are shots in Nightflyers that horror fans will be able to decipher - The Exorcist, The Shining, Psycho - and other moments that are littered in the show's DNA." Of course, film and TV history is packed with titles that can't quite strike the right balance between scares and science. In order to make the show seem believable, Buhler wanted take a more grounded approach to Nightflyers by making everything seem futuristic, but not so much that it appeared implausible, or out of touch. "We set the story of Nightflyers 75 years in the future so that the technology feels like it's just beyond our grasp. We didn't want to create anything that felt so far-fetched that you couldn't get your mind around it. That's when sci-fi loses its crowd. The main challenge is balancing sci-fi and horror because for horror to work, it has to feel like it could happen to you," he said. With shows like American Horror Story, The Haunting of Hill House, The Terror, and The Walking Dead revitalising the potential of horror on the small screen, there has never been a more creative time for the genre on TV. With ten episodes for audiences to get stuck into, the scares are going to range from the visceral to the psychological. There will be blood... but there's also plenty of room for those things that go bump in the night too. "We pushed the boat out in terms of the gore. Alien was a huge influence but if you look at films like The Shining, there's very little blood in it - excluding the elevator scene. In terms of violence, it's the threat of violence that makes The Shining work," said Buhler. "We wanted to build different levels and flavours of horror in the show. There are moments that are full-blown horror, then there's a sense of creeping dread. One of the tricks to doing horror in TV, is that in a movie, you can scare people for 90 minutes and then it's over. With TV, you have to keep coming back and you can't do the same scares week after week. You have to find new ways to get under people's skin. What we've done is create a number of devices and concepts that are built into the show." It's an interesting plot-device that allows the characters to delve into some past trauma and uncover new demons. "These allow us to explore new areas - like the memory sphere allows us to go into the past and people's memories. There's a psychic that can pull scary memories from your mind. This lets us get into other hooks and horror concepts," said Buhler. While Nightflyers is trying to mix the visceral with the psychological, there's no reason for horror fans to fear because the show isn't skimping on the blood, guts, and gore. "It's going to be R-rated. It's set in a heightened world with a lot of opportunity to explore violence in ways that are interesting from a psychological level. If you're just chasing people around on a ship, that becomes boring very quickly. We're focusing on the psychology of the characters. 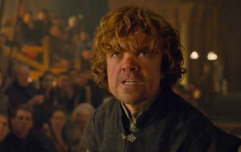 That's the George R.R Martin forte - to create characters that you're invested in," said Buhler. 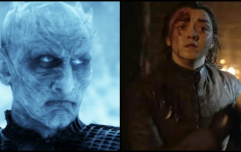 Speaking of Game of Thrones, despite the fact that they're literally worlds and genres apart, it's impossible for the show not to invite comparisons to HBO's iconic drama. It's the George R.R Martin effect. Again, rather than buckle under this expectation or shy away from the challenge, Buhler is relishing the opportunity to play in the world that Martin has created. "There wasn't a need to take a lot of licence with it (original novella) because George R.R. Martin builds worlds. As opposed to the Song of Ice and Fire books, where there's a load of novels with a lot of plot, this is an 100-page novella that sets up a world with these characters but doesn't define what happens. We set up Season 1 to essentially follow the course of events and within that, there was room to build new characters and ideas. There's horror in the book but we tried to amp that up." 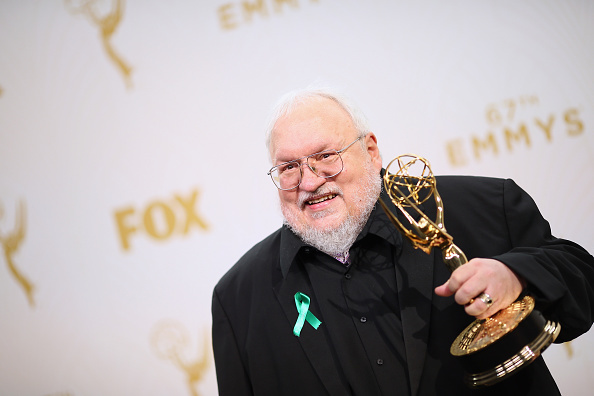 Having just finished his latest book which documents the complete history of House Targaryen in Fire & Blood, George R.R Martin is a pretty busy man at the moment. There's also the small matter of finishing The Winds of Winter. Martin has been keeping an eye on what's been going on Limerick's Troy Studios and there's one aspect of the Nightflyers production that has pleased him the most. "He's busy but he's thrilled and excited about the project. He wants to hear about the ship and loves that the character of Mel wasn't white-washed. When he originally published the book, he was told by the publishers that he couldn't do that (write a main character that's black) and unfortunately, he didn't have the clout then to push back because he was an up-and-coming writer. He always regretted not sticking to his guns. He was also not pleased with how the original film portrayed some of his characters but in the show, we built characters that are very representative and true of his vision. He was excited about that." said Buhler. After launching on SyFy last year, it's time for the show to be unleashed on Netflix and given the reach that the online streaming giant has, it appears that plans are already in motion for Season 2. "Yeah, I have some ideas. I feel like we threw so much at the wall in Season 1 that we have to go off and think about what's to come. When I pitched it originally, it was for multiple seasons and I've an idea for where Season 2 will go," said Buhler. "I know where we're going storywise but I've not allowed myself to think about it in detail just yet. This novella sits in a series of books called The Thousand Worlds. There are a lot of other ideas that are behind the curtain in that series. There's more going on in this universe, so we can get out and explore that if needs be." For fans of sci-fi and horror, the wait is almost over because Netflix viewers can board the Nightflyer when the show is released on 1 February.